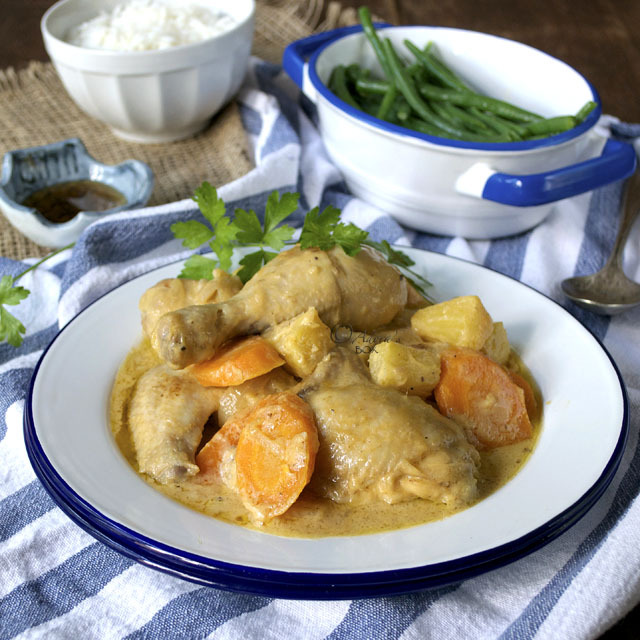 One dish that escapes the do branding is pininyahang manok. 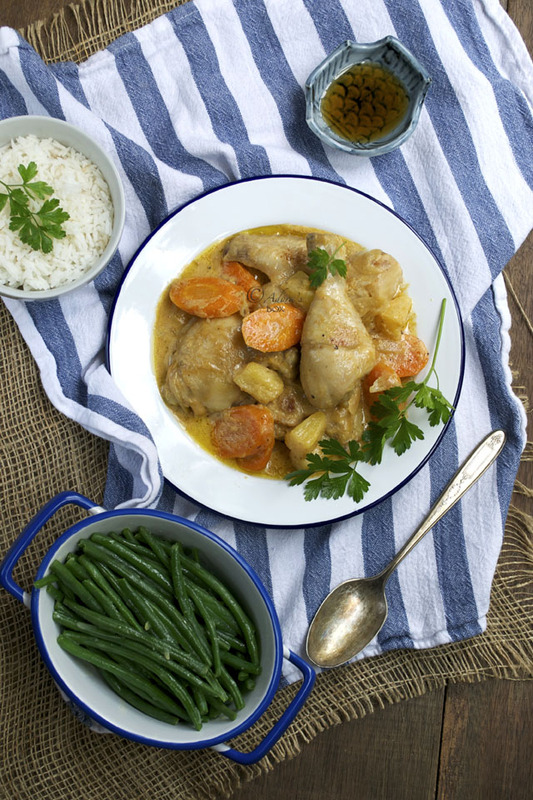 The name is more of a description than a recipe title and simply means chicken stewed with pineapple. As I have mentioned on numerous occasions, pineapple is a favourite Filipino ingredient whether in savoury dishes or desserts. I do not know the origin of this chicken stew but this is one of my town's signature dishes. 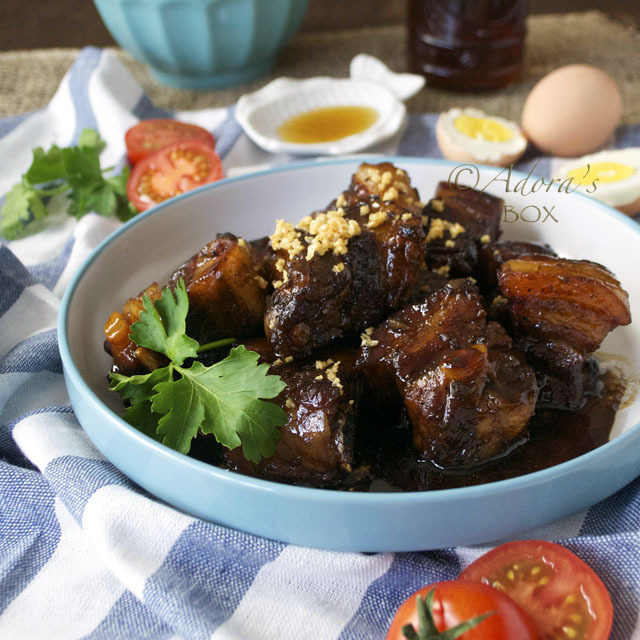 I have heard of similar Filipino dishes recipes but none is the same as this one. Aside from pineapples, this dish has milk and cheese added to enrich the sauce. It might not come across as a Filipino dish but having fish sauce as its salt gives it that Asian taste. It is quite a welcome change from the usual Filipino stew with tomato sauce. A sweet and creamy sauce make it appealing to children. 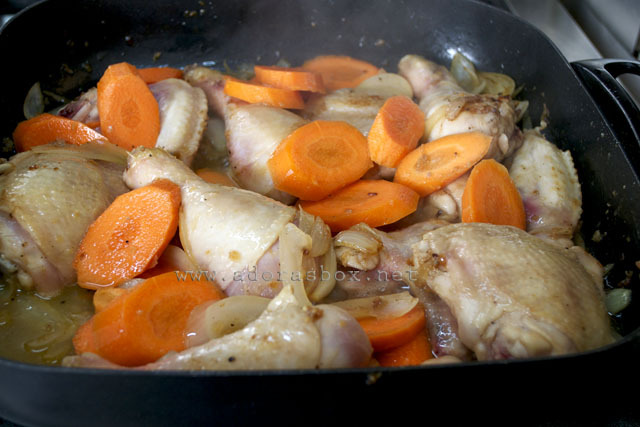 I always add carrots to my pininyahang manok although that is not usually done. Carrots improve the taste of the sauce as well as give the dish a boost in colour and nutritional value. that also does away with cooking a separate vegetable dish. Although cut up chicken (a whole chicken chopped into portions) is what's normally used in this dish, I used chicken portions cut at the joint. This gives a cleaner tasting sauce as the bone marrows does not bleed into it. 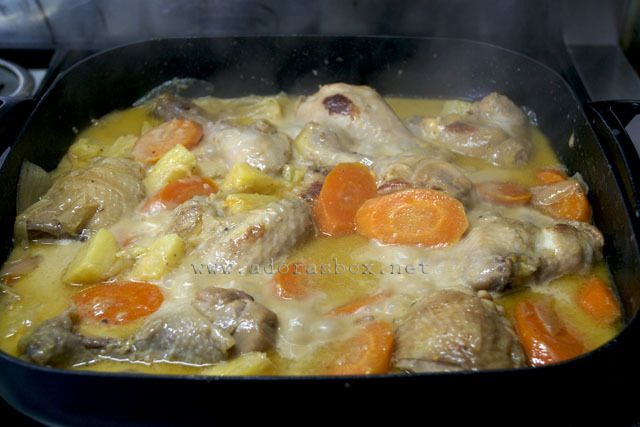 The process and ingredients for this chicken stew are both simple, hence it is an everyday dish. It can be cooked ahead and refrigerated. The flavour develops as it sits. Simply reheat and serve. My Mom used to take the leftover chicken pieces and pan fry them. This is so delicious, too, and takes the boredom out of leftovers. 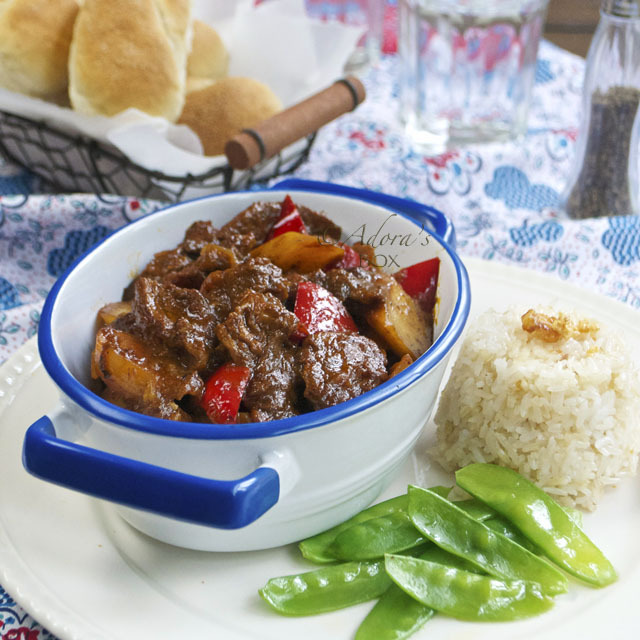 This is definitely a dish that even picky eaters will warm up to. Season the chicken with fish sauce and black pepper. 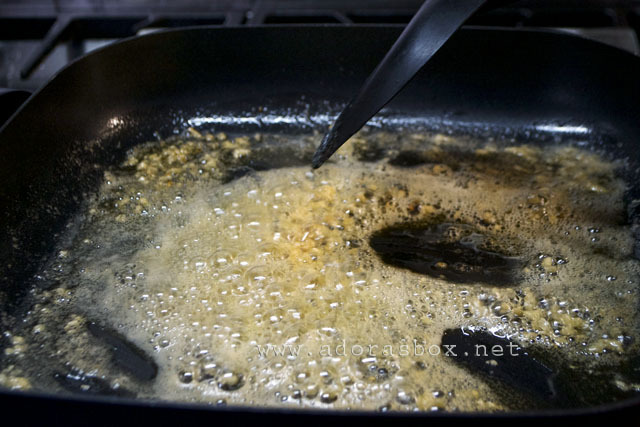 Heat up a sauté pan and add the butter or cooking oil. 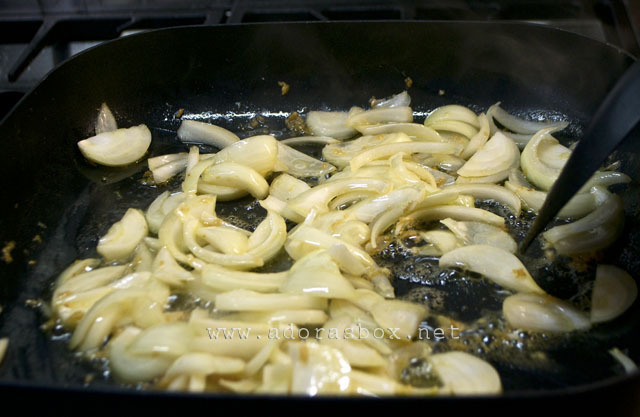 Add in the garlic and sauté until golden in colour. Add in the onions and cook until softened. Add in the chicken pieces. Stir. Cook on medium heat until the chicken pieces are sealed. Add in the reserved pineapple juice and carrot slices. Cover and simmer on low heat. 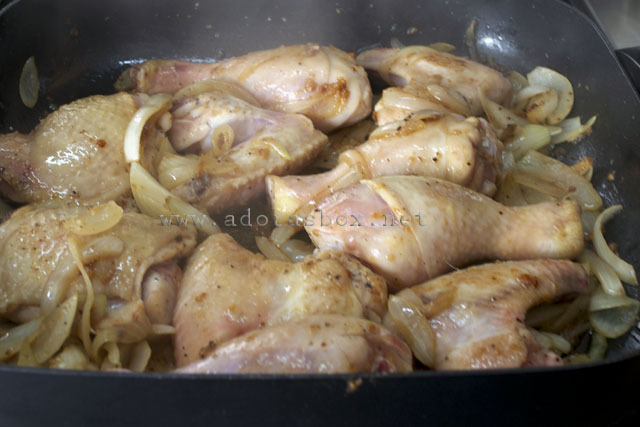 Add the water when most of the juices have evaporated and continue cooking until the chicken is tender, about 30-40 minutes. By this time the carrots will be cooked, too. Add in the cheese, milk and pineapple chunks. Stir and simmer for 5 minutes. The dish is now done. Transfer to a serving dish. Serve with fish sauce on the side. Your first pic already told me that this is a dish I would love to dig myself into. I love dishes like this, I feel this is so homey dish, so hearty and eat with comfort too. 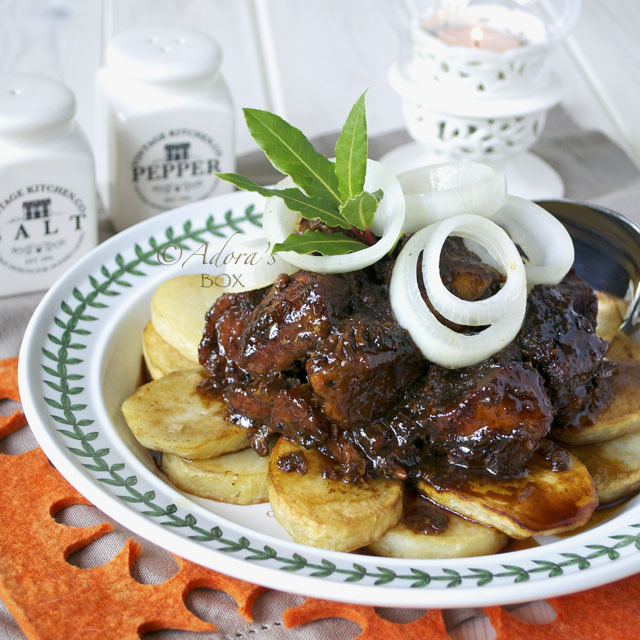 When I cooked something similar like this, usually I add carrot and potato; Pineapple is something different. Love to give it a try. OMG This does look wonderful. I thought of Marikina as part of the Tagalog region sharing Tagalog dishes, and for its famous shoemaking where I used to go if I have a design in mind but can’t find at stores. I’ve never heard of this dish, I am from Cubao, distance is like Maryland & Virginia. 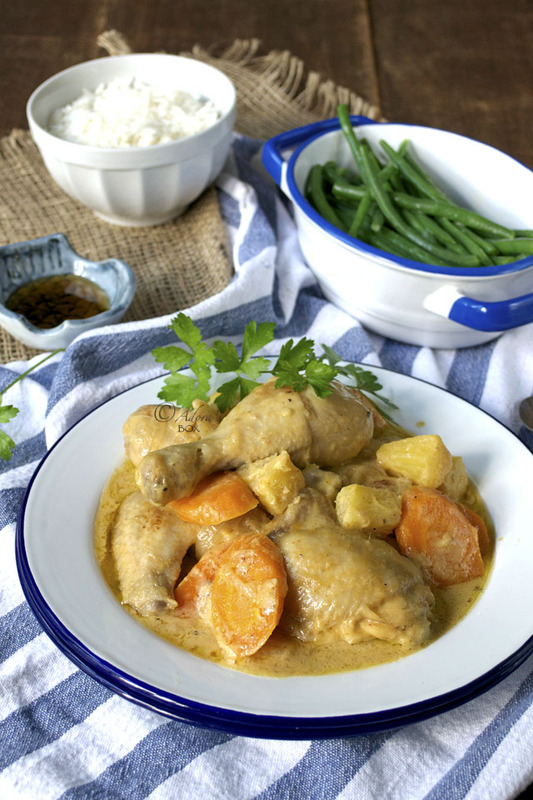 At first glance, it looks like Filipino Style Chicken Curry. It looks yummy and I love pineapple in a savory dishes. Hi Jean. Didn't know that we grew up in neighbouring towns/cities. Yet our paths never crossed 'til now. This dish is one of our staples. I use to have a pineapple and chicken dish, but haven't made it in years. But I do know it was nothing like this one. What a fabulous chicken dish! Looks like it's time to make chicken and pineapple again.